zeroed out before processing ballots. counties in Ohio. Ohio has been Republican ever since - what a coincidence. " Rigging elections is indeed a crime, and it is the most heinous crime you can commit in a democracy, because it cuts us to the quick. It goes to the core of the great freedoms our country is supposed to be about. We are indeed pleased to learn that two of those responsible for preventing a lawful recount in Cuyahoga County have been indicted, and we are confident that there will be many more such indictments as the truth comes out. We are likewise pleased that John Kerry and John Edwards have chosen to stay in the federal recount case, and fight alongside David Cobb and Michael Badnarik for our American way of life. This was a good day for America. In League of Women Voters v. Blackwell, in federal court in Toledo, Judge Carr set a trial date of June 13, 2006. Additionally, he fixed February 28, 2006, as the last date for pretrial discovery, and March 1, 2006, as the last date for summary judgment motions. He also ruled that pretrial discovery should proceed despite the pendency of a dismissal motion made by the State of Ohio. The plaintiffs have until September 19th to respond to that motion. As my readers know, I usually try to just report things, and refrain from giving my personal opinions. But sometimes I just have to say something. And this is one of those times. I've been watching the work of Congressman John Conyers, Jr., since November, 2004. On every single important issue in this country, he is on the side of right, and has been leading the struggle for fairness, and for restoring the rule of law. If the United States is the sum total of the values expressed in the Declaration of Indendence and the United States Constitution, the historic love of its people for freedom, and their historic legacy of making freedom ring, John Conyers is the de facto President of the United States. He is certainly the President of my United States. George W. Bush is not and never will be a legitimate leader of this country, not only because he was never legally elected, but also because he has neither understanding of, nor respect for, the qualities upon which our country is based, and which distinguish it from the powerful dictatorships we helped vanquish in the Second World War. His value system is might over right. Ours is a rule of law that treats all people as equals. John Kerry, by his November 3, 2004, abandonment of the Ohioans who had fought so hard for democracy, relinquished any claim he had to leadership. If John Edwards hopes to be the President of the United States, he needs to sit down at the foot of Congressman Conyers, and to first humbly ask this great American to forgive him for failing to come to the aid of his country on November 3rd. Then he needs to ask Congressman Conyers to show him the way home, the way back into the struggle. And he needs to distance himself immediately from the pandering, self serving, policy of appeasement adopted by almost all the Democratic members of the United States Senate. America owes a debt of gratitude, so profound that it can never be repaid, to Congressman John Conyers, Jr., a beacon of light in what has been one of our country's very darkest hours. He is the keeper of the flame. I would like to express my deepest appreciation for your role in intervening to protect the rights of the candidates seeking the 2004 election recount in Ohio and I applaud you for your great efforts to stand behind the voting public, urging them not to lose faith in our election system. As you are aware, this has been the second consecutive presidential election where numerous issues were raised concerning irregularities and improprieties within the system. Specifically, we learned of the massive disenfranchisement of fellow voters, as well as numerous incidents of voter intimidation and the purposeful dissemination of misleading information to the voting public, with the intent to interfere with the system. In addition, we learned of numerous irregularities in the way the recount in Ohio was conducted. I therefore commend your willingness to intervene in the recount case as it proceeds in the federal district court in Ohio and to join the candidates and voters in their struggle to fix a seemingly broken system. It is only by investigating these voting irregularities in each past election that we are able to ascertain the problems and pursue a better election process in each succeeding election. It is for these reasons that I am deeply concerned to learn of the possibility, however remote, that you may be considering withdrawing from the 2004 election recount case in Ohio. As you know, it is absolutely imperative that we have elections that count every vote of every eligible voter, and if there is any issue that is central to a strong democracy, it is ensuring that all eligible voters are able to participate in our elections without encumbrance or interference from others. There is no question that your continued participation in this case will help ensure that we restore trust in our election system. As you continue your participation in this important case and we continue our investigation of the voting irregularities during the 2004 presidential election, we hope to be able to maintain an open dialogue. As you know, the objective of the recount itself was never to overturn the election, but to win back the confidence of the electorate in the accuracy of voting methods and the fairness of voting procedures. The objective remains the same for the pending case in federal court challenging the unconstitutional manner in which the Ohio recount was conducted. If you have any questions or concerns, please contact my office at (202) 225-6504. (d) recount obstruction, and (e) vote machine tampering. The "permanent" link to this post is at the bottom and can be ascertained by right-clicking the phrase "Permanent Link to this Post". (But please note that it is not entirely "permanent": each time the post is updated in a new month, the 2-digit number for the month changes, and when it is updated in a new year, the 4-digit number for the year changes as well). If you have information on upcoming hearings, court dates, or other legal events, please send by email to ohioelectionfraud@mindspring.com with "oef" as the subject. Court Conference Scheduled for Tuesday, August 30th, in League of Women Voters v. Blackwell. State of Ohio to File Dismissal Motion. In League of Women Voters v. Blackwell, the judge (Chief Judge David Carr) has scheduled a status conference for Thursday, August 30th. The conference will take place at the federal courthouse in Toledo, Ohio, in the courtroom of Judge Carr. The defendant the State of Ohio has indicated that intends to file a motion to dismiss the complaint as against the State, and its motion is due to be served by August 29th. Last week we sent an email asking you to contact Senator John Kerry urging him not to withdraw from the Ohio recount case pending in federal court in Ohio. Since then, many of you have taken action and have voiced your concern to Senator Kerry. Thank you. Your voices are critical in the ongoing struggle to protect the right to vote. Some friends have responded by asking for further information or have suggested that the fight in the Ohio recount case is no longer worthwhile. We write to address these concerns. Is Senator Kerry planning to withdraw from the case? Is fighting the Ohio recount case still worthwhile? The struggle for the right to vote includes the struggle to ensure that all votes are properly counted. A recount is the procedure for doing that. If election officials resist our right to a meaningful recount conducted in accordance with basic constitutional standards, they trample on our right to vote. Senator Kerry must not withdraw from the Ohio recount case. What is at stake in the Ohio recount case is whether recounts in federal (presidential and congressional) elections will be conducted in accordance with basic equal protection and due process as guaranteed by the US Constitution or whether they will receive the same kind of sham recount received in Ohio in December. For a fuller understanding of all of the serious violations that occurred during the recount in Ohio last December, see the amended counterclaims filed by David Cobb and Michael Badnarik at: http://www.nvri.org/about/ohio_cobb_badnarik_counterclaims_123004.pdf. These amended counterclaims raise major constitutional concerns. David Cobb and Michael Badnarik are to be congratulated for continuing to press this fight for all of us. Senator Kerry should continue to stand by their side. Thank you for all you are doing to ensure that recounts matter and that all votes are properly counted. 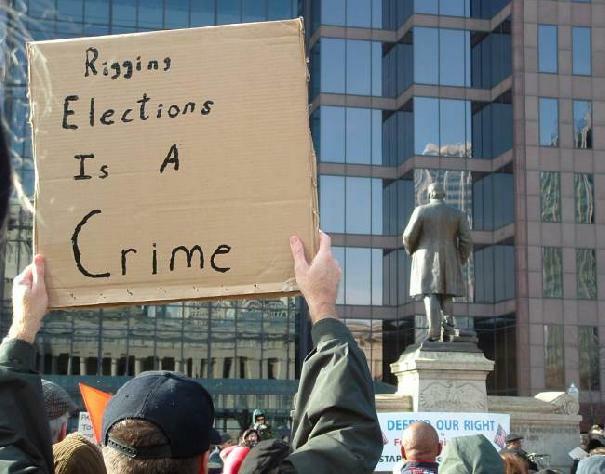 The Cleveland Plain Dealer reports that a Special Prosecutor in Cuyahoga County has subpoenaed witnesses in an investigation of charges of wrongdoing in connection with the 2004 recount. "Republicans find themselves with plunging poll numbers and an uncertain electoral landscape in 2006. Failure for them in their drive to keep control of the House of Representatives, and one party rule in Washington, means that, if reelected, I will become Chairman of the House Judiciary Committee, Henry Waxman will become Chairman of the Government Reform Committee, Louise Slaughter will become Chair of the Rules Committee, Charlie Rangel will Chair the Ways and Means Committee, and Nancy Pelosi will be the first woman to be Speaker of the House. That means accountability for this Administration with a stiff dose of the truth. "Make no mistake about it. Desperate times will lead to desperate tactics and partisans supporting Republican candidates will pull out every dirty trick in the book to stop us from bringing checks and balances back to the federal government. What do we do about it? "First, we must be vigilant and we must use every legal means at our disposal to stop the pre and post election manipulations. Second, we must push for legislation at the state and federal level to reform our elections, including providing a voter verified paper ballot. "More immediately, however, we must work harder to take back the House and to do so by a large enough margin so that the malfeasance and fraud makes no difference. I want you to start today (the election is just a little more than 14 months away) because they are. Start organizing in your neighborhood and precinct. Join your local democratic party if you haven't already. Talk to your relatives and friends about how much is at stake in 2006. Support progressive and alternative media that help get our message out by spreading the word about your favorite progressive talk radio hosts and stations, and the blogs you read. Support the candidates of your choice by signing up to be a volunteer for their campaigns, for the DCCC, or by making a financial contribution. Write letters to the editor about the lack of accountability in our government for the bad decisions made by this Congress and this Administration. "In sum, I have a small request: do everything you did for the 2006 election that you did last year in a close Presidential election marred by malfeasance and fraud, and then do more. It is never too soon to start." This is a selective list of videos and audios, available online, about the 2004 election. I am just beginning to prepare this list, so if you have suggestions for additional links, which you feel merit inclusion, please send them to me at evidence@ohioelection2004.com. Video of November 13, 2004, hearing at New Faith Baptist Church, Columbus, Ohio. Video of November 15, 2004, hearing at Franklin County Courthouse, Columbus, Ohio. Video of 51 Capital March, Protest and Rally, Statehouse, Columbus, Ohio. Election Day Ohio videotapes by volunteer filmmakers. Audiotape of November 13, 2004, hearing at New Faith Baptist Church, Columbus, Ohio. (Pacifica Radio). Songs from "Ohio in the Dark" album. 1597 Registered Franklin County Ohio voters whose provisional ballots were not counted on the ground that they were "not registered"
Link 0535 will now take you to the updated report. The King City Democrats have invited Oregon Voter Rights Coalition and any interested people to their August meeting. We are encouraging people to attend this event in place of our usual monthly meeting. Thom Hartmann will be speaking on a number of issues, including election fraud/reform. 15245 SW 116th Avenue, King City, Oregon. The agenda will include a short business meeting. All ages are invited to attend. Directions: From Portland south on 99 to Royalty, 1 block past Beef Bend Rd, turn right 1 block, right again. The Town Hall is on the left. From I-5, Durham Road until it ends and you are forced right (just across 99) onto 116th. Second block on left. Forum on Voting Reform -- Zanesville, Ohio -- Saturday, August 20th, 12:00 Noon - 2:00 P.M.
Can We Make Ohio Elections Honest Again? Sponsored by the Muskingum County Women's Democrat Club, a special 2-hour forum of speakers and discussion will be held at the Heavenly Ham restaurant, 2579 Maple Avenue, Zanesville Ohio (Come at 11:30 and buy yourself lunch). Several featured speakers include electoral reform speakers and voting researchers from around Ohio. The public is invited to attend and learn about the ongoing issues affecting your right to vote, directly from election activists involved in the 2004 electoral process. Did your vote count last November? Will it count in 2006 and in 2008? As a citizen you have a right to know and learn more. *In Ohio, which voters were targeted to be discounted? How were people disenfranchised? *What is the relationship between Ohio's Coingate and other public financial scandals and the big voting machine manufacturers? *Which voting machine vendors are bribing our officials? *How easily can the new electronic voting machines be hacked and vote totals changed? *Are “paper trails” the answer to verifiable voting? *How can we have citizen oversight of elections again? "We should remember that, at the turn of the 20th Century, allegations of "good government" were used by white Democrats in a remarkably successful strategy to suppress the black vote. The result of those very successful efforts was to impose barriers like the literacy test, which excluded African Americans from voting throughout the South for the better part of the century, until after the Voting Rights Act of 1965. If you go back and read some of the documents from the late 1800's and early 1900's, as I've recently been doing, the similarity to the sort of arguments being advanced now in support of photo ID laws is frightening. It is beyond unfortunate to see the same sort of tactics, albeit dressed up in more respectable garb, being employed at the start of the 21st Century." A superb article by noted commentator Mark Crispin Miller, which deals primarily with the stolen Ohio 2004 presidential election, appears as the cover story in this month's issue of Harper's Magazine, the August 2005 issue. 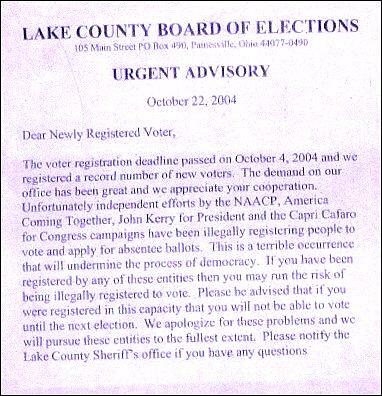 In view of the unusual reporting of the election results from the Hackett/Schmidt election taking place yesterday, on August 2nd, there may be heightened interest in the 2004 illegalities which took place in Clermont, Warren, Hamilton, and other counties implicated in yesterday's "election". Accordingly I have expanded the number of older posts appearing on this page. Older articles can still also be found through the weekly archives, or through the search function. electors in the Ohio State Supreme Court, has died. long-time activist in the Columbus area. "COLUMBUS, Ohio -- Former city school board member Bill Moss, whose tenure was marked by colorful theatrics, including a shoe-pounding incident in 2003 that shut down a board meeting, died Tuesday. He was 69. "Moss, a well-known activist who helped file a lawsuit that challenged last year's presidential race in Ohio, died at Riverside Methodist Hospital, said Andrew Marcelain, spokesman for Columbus schools. "Moss was being treated at the hospital for a stroke suffered last week while traveling through Pennsylvania, The Columbus Dispatch reported on its Web site. A hospital spokesman confirmed the death but declined to comment on the reason for Moss' hospitalization." We must rededicate ourselves to fight on for what he stood for. Wonder who would have sent such a thing. The day-in, day-out, important work being done by Brad Friedman on The Brad Blog is incredible. Today he exposes a Hitler-like group of GOP trolls masquerading as 'voting rights activists': http://www.bradblog.com/archives/00001650.htm.